This monster, though, is something different. Something ancient, something wild. And it wants the most dangerous thing of all from Conor. It wants the truth. Patrick Ness has written a powerful and haunting story about a 13-year-old boy trying to deal with grief and loss. This beautifully crafted story is also filled with dark humor, vivid imagery, fear, rage, and courage. The characters are realistic and fleshed out. Conor O’Malley is dealing with the nightly visits of a monster at precisely 12:07 a.m., but it’s not the monster that frightens him. It is the recurrent nightmare “that is filled with darkness, screaming and a hand slipping from his grasp.” The dream begins when his mother starts chemotherapy and is so terrifying that he hasn’t told anyone. His father is remarried and living in America, his grandmother is cold and doesn’t understand him, and the kids bully him at school. Conor is totally alone. Ness brilliantly creates a monster that resembles a nearby ancient Yew tree to act as a catalyst to help Conor face his greatest fear. The monster shares three tales with him and tells Conor that he will tell the fourth story which will be his truth. The plot is distinctly realistic and the tension is palpable. Readers will ride Conor’s roller coaster as his world spins out of control. In confronting his fear and releasing his rage, Conor destroys his grandmother’s living room — all important steps that will lead him to face the final truth and heal. Jack Kay liberally uses his pen and ink drawings to illustrate the darkness and intensity of Conor’s fears and rage on each page, heightening the emotion and the scary truth that lies ahead. The total package is a beautiful collaboration between author and illustrator. Note: In his introduction, Patrick Ness says he never met Siobhan Dowd. She had a final story idea, but her premature death from cancer prevented her from writing this story herself. This would have been her fifth book. According to Ness, “she had an idea, the characters, a premise, and a beginning.” With some hesitation, Ness undertook the project and decided from the start that “he would not write a novel that mimicked her voice.” Visit Patrick Ness at his website. Posted on June 22, 2015 by Patricia Tilton •	This entry was posted in Cancer, Grief, Patrick Ness and Siobhan Dowd, Young Adult Book Review and tagged Bullying, Cancer, Family Relationships, Loss, Monsters, Nightmares. Bookmark the permalink. I’ve read this one and really liked it. It is very well written. Glad you liked the book. I am a Patrick Ness fan but haven’t yet read this one. He sure knows how to GRIP a reader and not let them go. This really is a unique book. I know that you would love this story and studying the author’s style. What a powerful book! 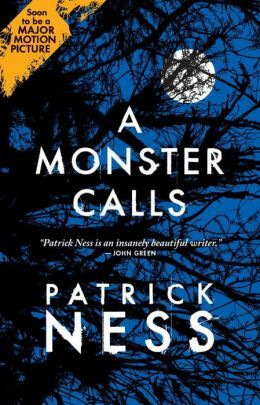 I’ve never read any of Patrick Ness’ books, but this one sounds very special. With the monster telling the boy the stories, it sort of reminded me of Dickens’ a Christmas Carol. Great review, Pat! It’s going on my list. This was my first Patrick Ness book. It is special in so many ways. It is profoundly sad, dark and funny. Now it will be made into a movie. I’m going to give this one a try later this summer when my pile of to be read books lessens a bit. Glad to know this important story will be made into a movie. Thanks for the heads-up. Greg, I think you would like the author’s dark humor. And, he’s an expert at making the reader feel connected to his characters. Sounds like a serious book, one that teens will get into. A great review. Thanks. Thank you Darlene. Teens will like this book. I already want to cry from the description. I would need to be in a really happy mood to read this because I might bawl just a bit less? It sounds like a beautifully written book though. It is sad, but has a dark quirkiness about it. Will be interesting to see what they do with a movie. Wow! I can see why this is being made into a movie. Great review, Pat. Thank you Cathy. I enjoyed Ness’ writing style and how well he developed his characters. This looks beautiful. So glad to be back visiting you, Patricia. It is beautiful story about dealing with grief. I know you’ve been busy and was wondering when you’d announce your new website. Sounds like you have a lot planned. Wow, sounds like a powerful story. The blurb sounded very sad. It is a powerful story that deals with grief. Heartbreaking and wonderful.